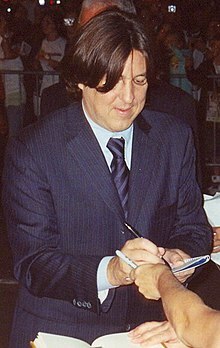 Cameron Bruce Crowe (born July 13, 1957) is an American director, producer, screenwriter, journalist, author, and actor. Before moving into the film industry, Crowe was a contributing editor at Rolling Stone magazine, for which he still frequently writes. Crowe's debut screenwriting effort, Fast Times at Ridgemont High, grew out of a book he wrote while posing for one year undercover as a student at Clairemont High School in San Diego, California. Later, he wrote and directed one more high school saga, Say Anything..., followed by Singles, a story of twentysomethings that was woven together by a soundtrack centering on Seattle's burgeoning grunge music scene. I think there's always satisfaction that comes from digging in and telling a story and being on the front line and writing about it. I think there's a venue available if you look. Even print journalism is in good shape in areas. I've been out doing signings and talking to a lot of people, and I'm just really grateful. Stars arrive on their own timetable. I think sometimes good sentimentality is fun when it's balanced. In the future, everybody is going to be a director. Somebody's got to live a real life so we have something to make a movie about. It's more like can I build a group of characters and can I tell some universal truths that feel real and aren't formulaic in the spirit of filmmakers gone by who've told American stories that were personal and universal as well. People are going to go where they get characters that they remember. I mean, Internet radio, which is basically a guy with his iTunes putting it over the computer, is the only way you're going to get true eclectic music programmed. 'Elizabethtown' was a movie made for all the right reasons, and people who connect with the movie really connect to it. It's not the biggest group of people ever, but I still really believe in 'Elizabethtown.' It wasn't, like, a savage blow. Probably having fallen in love with music and movies at a young age and then first learning about writing by kind of following the path of writers like Dave Marsh and Lester Bangs and being a rock journalist. Some of the hip-hop stuff people get into is exciting, because there's a passion and there's something to explain to a more mainstream audience, so you get these passionate writers who want to express their love for rap and hip-hop, which is cool. I'm always writing. A friend of mine once said, 'You avoid re-writing by writing.' Which is kind of a good point, because re-writing seems to be mostly about craft, and writing is just, like, getting out your passion on a piece of paper. Great music is its own movie, already. And the challenge, as a music fan, is to keep the song as powerful as it wants to be, to not tamper with it and to somehow give it a home. I try and direct environmentally, so that people don't feel like everything is going to depend on what happens when someone says, 'action,' so that they can literally be swimming in the warm water, and at some point the race begins, and at some point the race ends, but it is about being free to swim. I always wanted to tell the story of how Pearl Jam is the story of lightning striking twice. As well as being the flipside of the classic rock tale where great promise ends in tragedy. This is where tragedy begins great promise. Well it kind of is project to project because as a writer I think you always write to some degree about things that you know or things that happened - but my favourite filmmakers, my favourite movies of theirs tend to be the personal movies. I have my problems with 'Singles'. To me, 'Singles' is the least successful of the movies I've been lucky enough to make. I'm proudest of the fact that I've been able to make a few movies in the studio system that are slightly unorthodox and personal. But it's never quite as easy as you dream that it could be. And I liked that whole idea that energy comes from not disseminating your ideas and talking about them. Time puts things in proper perspective. People dance and we have a lot of music and... this might be the closet I get for a while. Making a big Hollywood film that really affects people is as hard as making a small movie on a credit card. I always loved movies, but I never thought I would presume to be a screenwriter and definitely not a director.